This one is a classic. 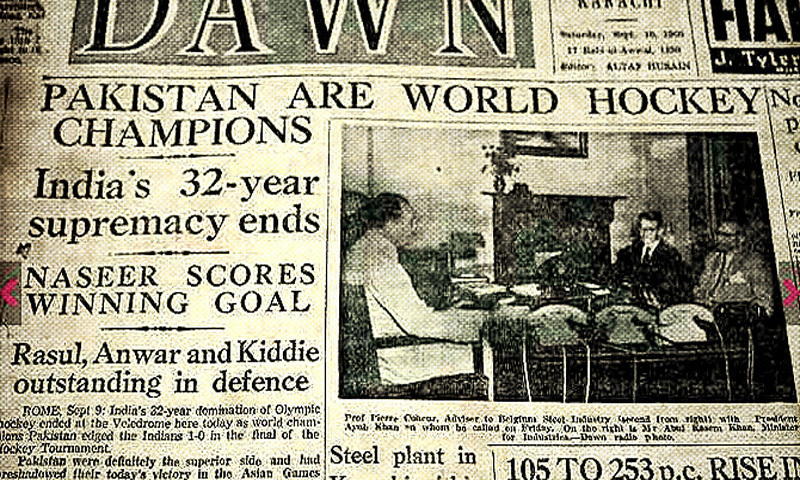 In 1960 Pakistan beat India 1-0 to win hockey Olympic gold meal and this is what Dawn used as a headline. This win was special because not only it was against India but before that India had won 6 consecutive Olympic gold medals. Nice find. Would love to see video of that match if available but I am not too hopeful about it because I remember there is no video available of first Hockey World Cup either which Pakistan won. May be PTV has in its archive. (09-24-2017, 12:28 AM) msalman Wrote: Nice find. Would love to see video of that match if available but I am not too hopeful about it because I remember there is no video available of first Hockey World Cup either which Pakistan won. May be PTV has in its archive. You are right about first Hockey world cup which was played in Spain in 1971 but the video of 1960 Olympics is available. Check following video in which you can see Pakistan's winning goal at no. 3. Hockey world cup didn't start until 1971 so may be Dawn used world hockey champions title because Olympics was the biggest tournament at that time. In any case it made the heading iconic.